This brass fine thread pitch collet is designed ro match our PS500-40 series of precision threaded ball ended screws. The 40 thread per inch internal thread provides smooth fine adjustment control of the mating screw. 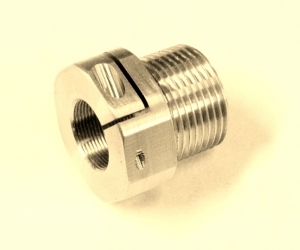 The external mounting thread is a standard 3/4"-20 UNEF.